Why React Is Taking Over Front-End Development? Working with the DOM API is hard. React basically gives developers the ability to work with a virtual browser that is more friendly than the real browser. React’s virtual browser acts like an agent between the developer and the real browser. React enables developers to declaratively describe their User Interfaces and model the state of those interfaces. This means instead of coming up with steps to describe transactions on interfaces, developers just describe the interfaces in terms of a final state (like a function). When transactions happen to that state, React takes care of updating the User Interfaces based on that. But there’s a lot more to it than just that. Let’s attempt to cover all the reasons behind React’s rising popularity. One reason is its Virtual DOM (React’s reconciliation algorithm). We’ll work through an example to show the actual practical value of having such an algorithm at your command. When you hear the statement that “React is declarative,” this is exactly what it means, we describe User Interfaces with React and tell it what we want (not how to do it). React will take care of the “how” and translate our declarative descriptions (which we write in the React language) to actual User Interfaces in the browser. React shares this simple declarative power with HTML itself, but with React, we get to be declarative for HTML interfaces that represent dynamic data, not just static data. 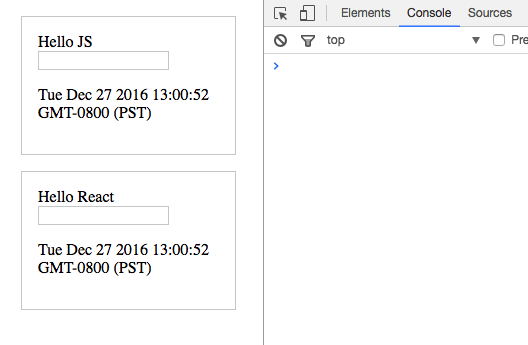 In React, we describe User Interfaces using components. You can think of components as simple functions (in any programming language). We call functions with some input and they give us some output. We can reuse functions as needed and compose bigger functions from smaller ones. Components are exactly the same; we call their input “properties” and “state”, and a component output is a description of a User Interface (which is similar to HTML for browsers). We can reuse a single component in multiple User Interfaces, and components can contain other components. Unlike pure functions however, a full React component can have a private state to hold data that may change over time. React’s name is the simple explanation for this concept. When the state of a component (the input) changes, the User Interface it represents (the output) changes as well. This change in the description of the User Interface has to be reflected in the device we’re working with. In a browser, we need to regenerate the HTML views in the Document Object Model (DOM). With React, we do not need to worry about how to reflect these changes, or even manage when to take changes to the browser; React will simply react to the state changes and automatically update the DOM when needed. We’re including two different scripts here for an important reason: The React library itself can be used without a browser. To use React with a browser, we need the ReactDOM library. Make sure this works in the browser. You should see the “Hello JS” line on the screen now. This demo div is our User Interface so far. It’s a very simple one. We just output a text for the user to see. Both document.getElementById and element.innerHTML are actually part of the native DOM Web API. We are communicating with the browser directly here using the supported APIs of the Web platform. When we write React code, however, we use the React API instead, and we let React communicate with the browser using the DOM Web API. React acts like our agent for the browser, and we mostly need to communicate with just React, our agent, and not the browser itself. I say mostly because there are cases where we still need to communicate with the browser, but those are rare. This container will be the only call we make to the native web API. ReactDOM needs this container to know where to host our application in the DOM. The first argument is the HTML tag, which is div in our example. The third argument is the content of the element. We’ve put a “Hello React” string in there. Let’s now add some more features to our simple User Interface. Let’s add a text box to read input from the user. At this point, if you’re questioning what we’re doing and thinking “this is complicating a simple process”, you are totally right! But there is a very good reason for what we’re doing. Keep reading. Both JS and React versions are still rendering the exact same HTML in the browser. As you can see, so far, using React is actually a lot harder than the simple and familiar native way. What is it that React does so well that’s worth giving up the familiar HTML and having to learn a new API to write what can be simply written in HTML? The answer is not about rendering the first HTML view, it’s about what we need to do to update any existing view in the DOM. So, let’s do an update operation on the DOM we have so far. Let’s simply make the timestamp tick every second. When we refresh the browser now, the timestamp string should be ticking every second in both versions. We are now updating our User Interface in the DOM. This is the moment when React will potentially blow your mind. If you try to type something in the text box of the JS version, you won’t be able to. This is very much expected because we’re basically throwing away the whole DOM node on every tick and regenerating it. However, if you try to type something in the text box that’s rendered with React, you can certainly do so! Although the whole React rendering code is within our ticking timer, React is changing only the timestamp paragraph and not the whole DOM node. This is why the text input box was not regenerated and we were able to type in it. You can see the different ways we’re updating the DOM visually if you inspect the two DOM nodes in a Chrome dev tools elements panel. The Chrome div tools highlights any HTML elements that get updated. You’ll see how we are regenerating the whole “js” div on every tick, while React is smartly only regenerating the paragraph with the timestamp string. Using the virtual DOM, React keeps the last DOM version in memory and when it has a new DOM version to take to the browser, that new DOM version will also be in memory, so React can compute the difference between the new and the old versions (in our case, the difference is the timestamp paragraph). React will then instruct the browser to update only the computed diff and not the whole DOM node. No matter how many times we regenerate our interface, React will take to the browser only the new “partial” updates. Not only is this method a lot more efficient, but it also removes a big layer of complexity for the way we think about updating User Interfaces. Having React do all the computations about whether we should update the DOM or not enables us to focus on thinking about our data (state) and the way to describe a User Interface for it.